BP's Whiting Refinery near Chicago finally returned to normal operation last week, after a prolonged maintenance shutdown that lasted over two months. The 430,000 bbl/day facility runs on a diet of mostly Canadian crude. Its outage severely dented Alberta's oil exports, and was partially to blame for the abnormally wide discount on Western Canadian Select (WCS), rising to as much as US$47 a barrel by the end of October. US imports of Canadian crude reached a record high of 3.7 million bbl/day in the summer, but sank to just 3.1 million by the end of September due to a heavy maintenance turnaround season in the Midwest region (PADD 2). PADD 2 is the largest buyer of Alberta crude, taking in about 2.5 million bbl/day, or two-thirds of all Canadian exports. Refinery utilization rates in the region have recovered from a low of just 70% in the middle of October to over 90% last week. Crude stockpiles at the Cushing storage hub in the Midwest have finally started to drop after rising for the past two months. 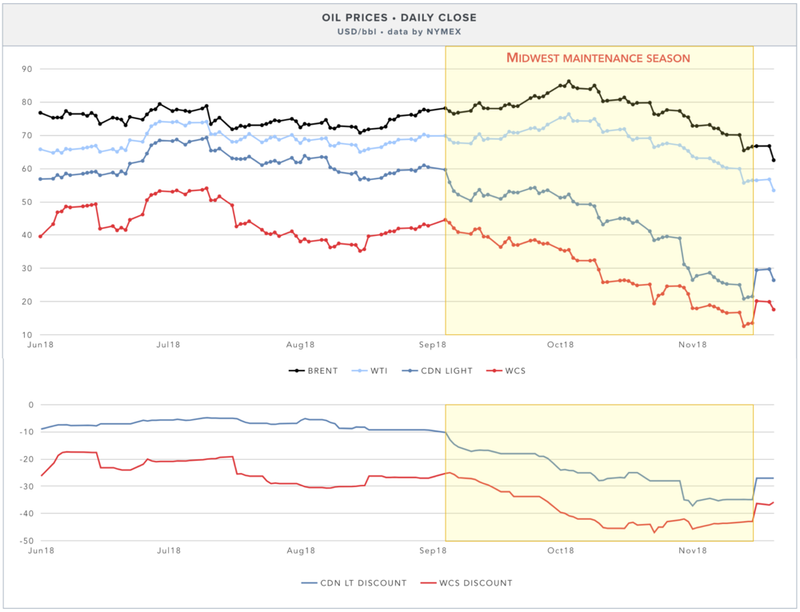 The WCS discount to WTI has since so far narrowed by over US$14/bbl this week, to less than US$33 on Friday.